Vivian Nicholson was born in 1922 in Sherburn, Co Durham. He worked as an apprentice in the family joinery business but when the war started he volunteered to join the RAF. He was sent to Canada on the British Commonwealth Air Training Plan. 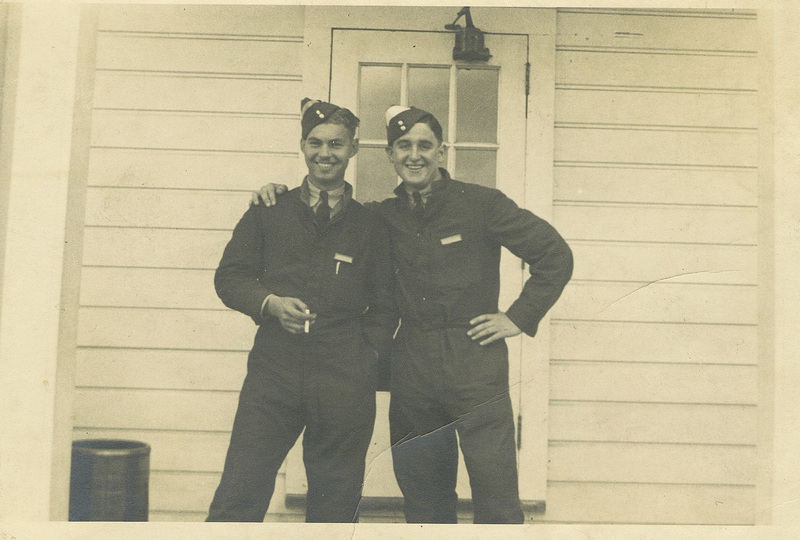 Canada, with its wide open spaces and safe distance from the main theatres of conﬂict in Europe, was ideal for aircrew training, and over 150,000 people from Britain, the Commonwealth countries and the USA, were sent there during the war. He started his training in Canada but then went on to Tuscaloosa, Alabama in the USA for part of his course. Even though the USA was not yet in the war, it was already providing training facilities for the Allies. On his arrival home, he was sent to No.10 OTU at RAF St Eval, Cornwall, in September 1942. He arrived there at the same time as bomb aimer John Fort and wireless operator Antony Stone, and it is likely that the trio teamed up there. All three arrived at No.1660 Conversion Unit at RAF Swinderby in January 1943, at the same time as William Hatton and Harold Simmonds, and probably crewed up there. A month or so later, they were ready for operations and they all left for 207 Squadron at RAF Langar in Nottinghamshire. Their first operational squadron was 207 Squadron, which they joined in February 1943. After a month, the crew, which still had no permanent pilot, was moved on to 97 Squadron at Coningsby, where they were allocated to David Maltby, returning to operations after his inter-tour break. 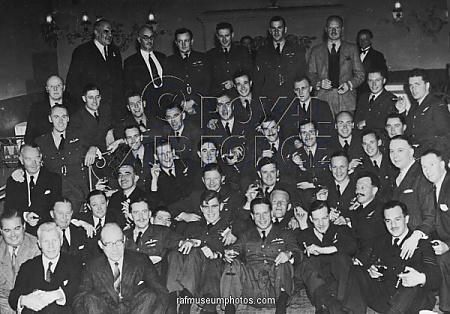 The whole crew was posted together to 617 Squadron on 25 March 1943. 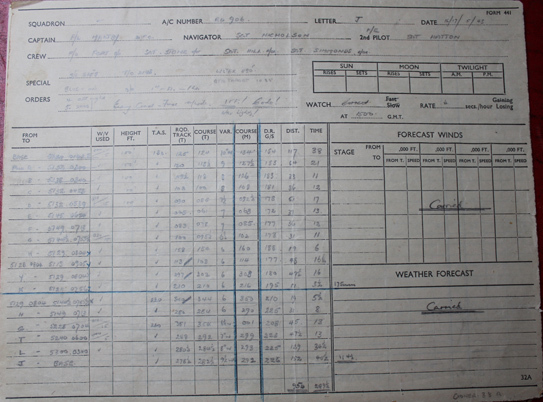 A navigator used a log sheet for each operation in order to record routes taken, changes in bearing, times of fixes etc. All these calculations were, of course, made by hand. Vivian Nicholson was on his first active operation on the Dams Raid, and we are lucky in that his log sheet has been preserved for posterity. Its accuracy has been commended by navigational experts in the years since. There was also space for the navigator to make his own notes during the raid, and he recorded comments such as ‘Bomb dropped.Wizard.’ immediately after the mine was released. Nicholson received the DFM for his part in the raid and took an active part in the celebrations at Buckingham Palace and in the Hungaria Restaurant on 22 June 1943. He can be seen in the famous restaurant photograph, sitting behind John Fort and David Maltby, with the arm of Jack Leggo, his Navigation Leader, draped over his shoulders. We can be sure that Leggo was proud of the textbook way his young protegé had carried out his first operation. Four months later, on 14 September 1943, Nicholson took off from RAF Coningsby on 617 Squadron’s first major operation since the Dams Raid. When their aircraft suffered its final crash it sank with the bodies of all the crew except the pilot, so he has no known grave. Vivian Nicholson is commemorated on the Runnymede Memorial.